Not to be confused with Kashkar. This article is about the city. 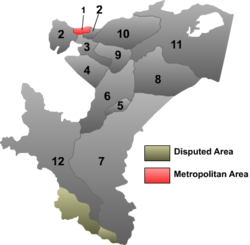 For the prefecture, see Kashgar Prefecture. Variant transcriptions of the official Uyghur: يېڭىشەھەر‎ [contradictory] include: K̂äxk̂är or Kaxgar, as well as Jangi-schahr, Kashgar Yangi Shahr, K’o-shih-ka-erh, K’o-shih-ka-erh-hsin-ch’eng, Ko-shih-ka-erh-hui-ch’eng, K’o-shih-ko-erh-hsin-ch’eng, New Kashgar, Sheleh, Shuleh, Shulen, Shu-lo, Su-lo, Su-lo-chen, Su-lo-hsien, Yangi-shaar, Yangi-shahr, Yangishar, Yéngisheher, Yengixəh̨ər and Еңишәһәр. - The postal romanization was 疏附 Shufu 1900s/50s, bilingual postmarks reading"SHUFU (KASHGAR)/date/疏附" were used in this period. 疏附 Shufu was also used on contemporary bilingual maps. Wikivoyage has a travel guide for Kashgar.